In November of 1965, Yu kon’s civil servants were among the few remaining Canadian government employees lacking any form of unionized association. On a Sunday afternoon in late 1965, this union was founded by a dedicated few who sought fair equity and representation for themselves at a time when their government had not even recognized a union for its federal employees. November 21, 1965 saw the formation of the Yukon Territorial Public Service Association. 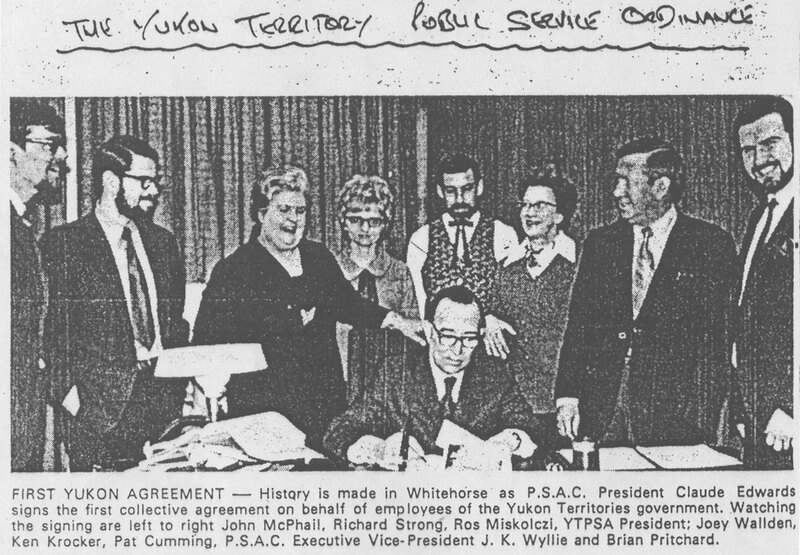 At the Whitehorse Canadian Legion Hall, the Yukon Territorial Public Service Association (YTPSA) was founded. YTPSA founding members included first President Bob Smith, Directors Jean Besier and Harry Thompson and Ione Christianson. Though initially intended to represent workers in Whitehorse, it was Ms. Christianson who advised that the membership expand to include the rural areas as well. 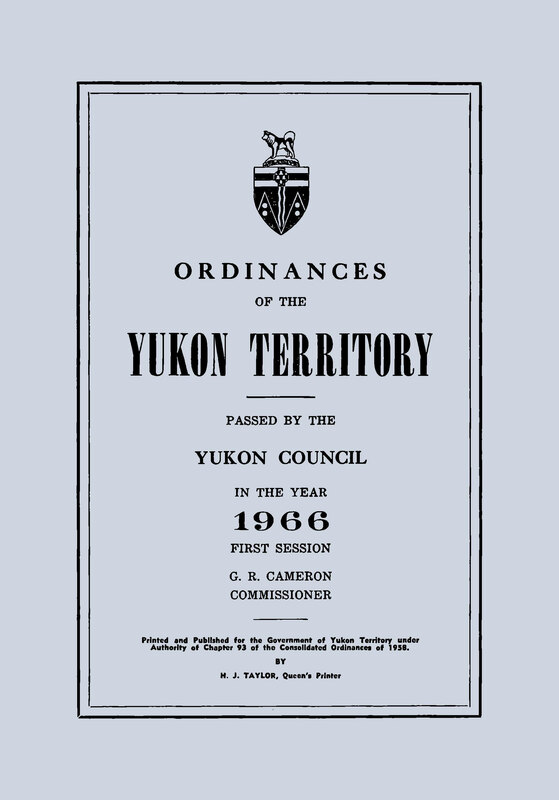 The constitution adopted at the first meeting stated the union’s purpose was “to unite all employees of the Government of the Yukon Territory for the promotion of their several interests and to promote their welfare and the betterment of their economic and cultural interests.” By promoting “a spirit of amity, unity, loyalty and efficiency in the Public Service” and through affiliation as a component of the Civil Service Federation of Canada (CSFC) the group sought the right to negotiate Collective Agreements for their members. The first order of business for the new union was a pay raise. Working conditions and very low rates of pay at the time contributed to a powerful sense of inequality with both provincial Government employees and Federal workers. 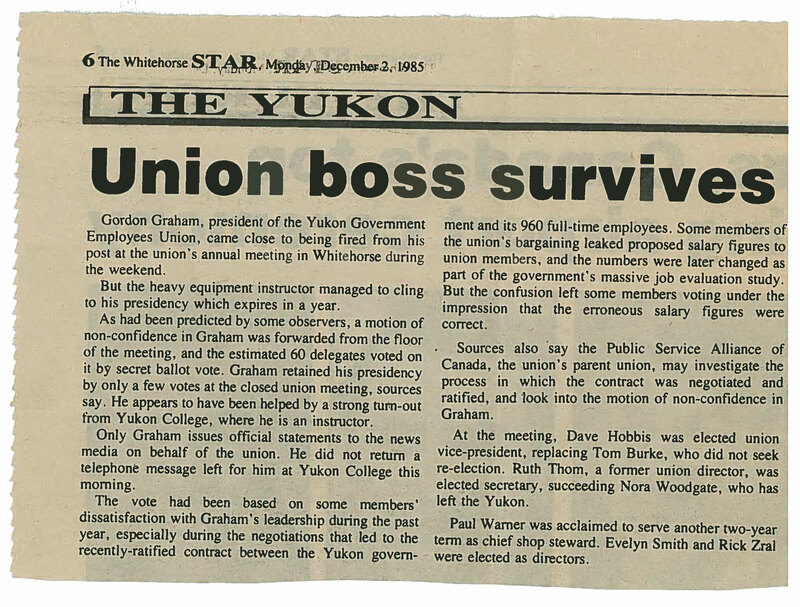 President Bob Smith approached Yukon Commissioner G.R. Cameron requesting an immediate 10% raise in pay. The union’s strong argument defending the request was forwarded to Arthur Laing, then Minister of Indian and Northern Affairs. In April of 1996, thanks to the determination of the group and the “enlightened thinking” of Commissioner Cameron, the YTPSA and its members achieved their wage increase request. This was accomplished without the legal right to bargain collectively on behalf of the growing YTPSA membership. By early 1967, records show that the YTPSA was pressing the Commissioner to introduce Collective Bargaining Legislation. This was denied. At the time, the signed membership constituted less than the required 50% plus one of the eligible 380 employees. The YTPSA was by now a fully accredited Local of the newly formed Public Service Alliance of Canada (previously the CSFC) and it was this association that helped drive up membership numbers. In 1971, the YTPSA celebrated their first Collective Agreement. The event was marked by the visits of PSAC President Claude Edwards and the PSAC Executive Vice-President J. K. Wylie. Rates of pay in the 1973 Collective Agreement show that a Key Punch Operator’s wage range was from $6571 to $7607 per year, while a Lottery and Games of Chance Manager could expect a top salary of 16,524. Vacation leave (an important bargaining win) was offered in the sum of 3 weeks leave for the first 5 years of employment, 4 weeks of vacation from the sixth year and 5 weeks for those employees with 15 or more years of service. There was no dental plan at the time though the employer was seeking a plan provider. Medicare costs were increased in the 1973 CA from a 50/50 premium split to a 60% payment from the employer. Maternity leave was in force; a woman who was pregnant was expected to take maternity leave starting 11 weeks before her due date and ending no later than 16 weeks after delivery. This was leave without pay, and was subject to employer approval. At any time however, “notwithstanding the above, the Employer may direct a female employee who is pregnant to proceed on maternity leave at any time where, in its opinion, the interest of the Employer so requires”. Male employees were offered a day of paid special leave at the discretion of the Employer on the occasion of the birth of his son or daughter. We’ve come a long way! The YTPSA faced many challenges during its first decades. 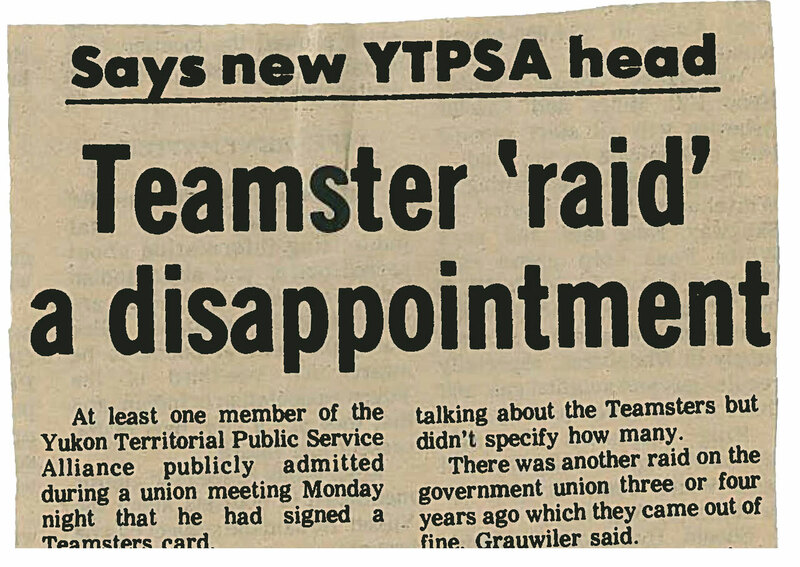 A determined first raid effort by the Teamsters saw the resignation of the entire Executive in 1975, and was followed by another attempt several years later. There were struggles with the PSAC and internal conflicts amongst elected officials of the YTPSA. All the growing pains however happened alongside the continued strengthening of the Union. As the years passed, new Bargaining Units were certified and the membership grew to exceed 5000 members and more than 20 different employers. We’ll be telling more of the history of YEU over the coming months; we hope you’ll check back. If you were part of the story please contact us to share what you remember. There are many gaps in our records of those early years. YEU, YGEU, YTPSA has a proud history. We were born in the Yukon, raised in the Yukon. Our story is not one of a group of workers “organized” by any big outside force. We did this for ourselves, by ourselves. 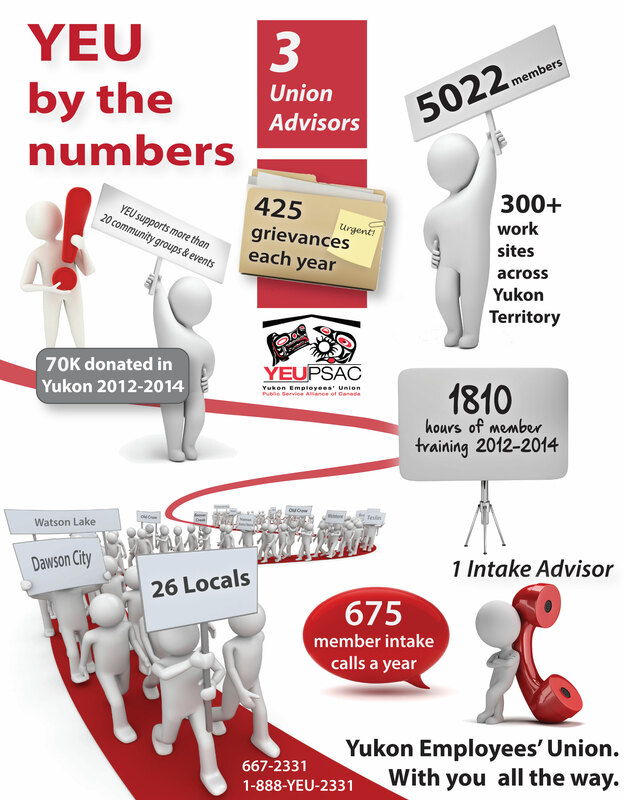 YEU developed largely independent of the guidance and structures that were available to other unions. Our leaders were hardworking and flawed without a doubt, but they pressed on through mistakes as they learned how to achieve their collective goals. We are grateful for their solidarity. 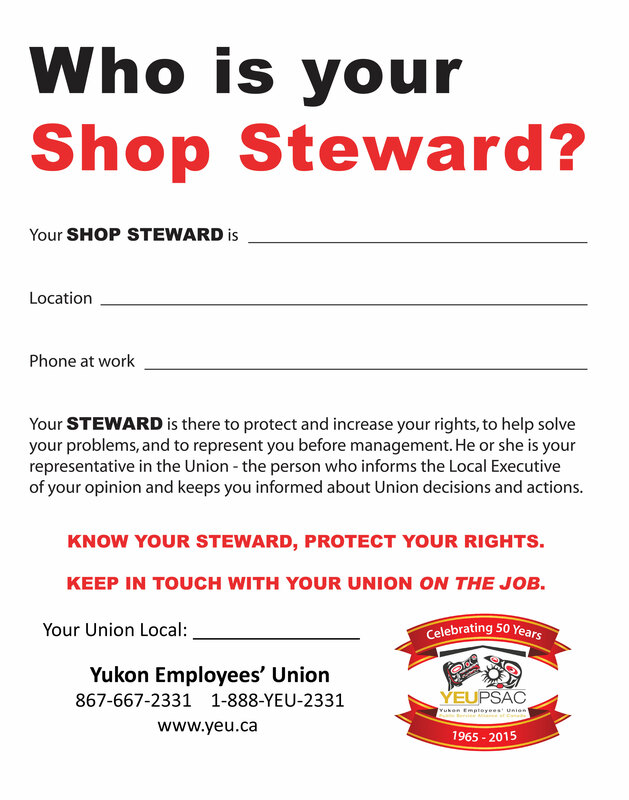 Web Links, Weirdness & Wild Times OR how to register for the YEU/PSAC Shop Steward Conference! Hello friends. If you have been trying to register for our Shop Steward Training Conference March 10-11 and have been frustrated by bad links in the email or Facebook post PLEASE accept our apologies. At the end of January our website was transferred from one host to another… and that’s where the fun really began. Our communications officer has been adding links, posting images and new contracts etc. to our website regularly however things have gone a bit sideways. Due to the transition from one host to another, there have been crossed wires and all sorts of wild and crazy fun. Most of that fun has involved vanishing links, missing posts and re-directs to the outer reaches of nowhere. 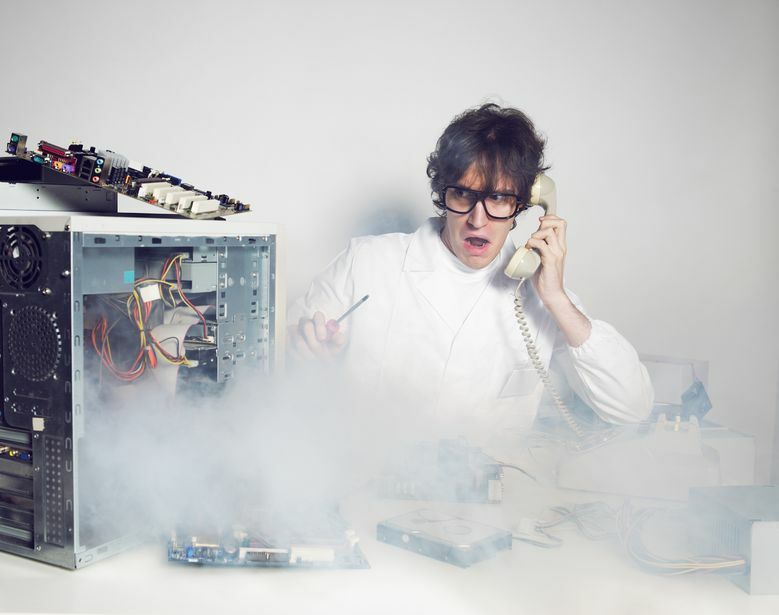 Our IT guy is hard at work getting our wires un-crossed and making sure the website is safely and securely housed in its new web home. We hope to have our website angst solved by the end of this week. In the meantime we hope you will hang in there! The YEU/PSAC Shop Steward Conference online registration link works just fine from pretty much any computer. It’s the agenda and the posters that have been swallowed up by the ether (unless you happen to be INSIDE the walls of YEU when opening the file… go figure). So, please follow THESE links to see the information you can’t access through the yeu.ca site right now. We’ve uploaded them to this blog as it’s unaffected by the website host change “situation”. Thanks for you patience! And remember… you don’t HAVE to be a Shop Steward to participate in this training. 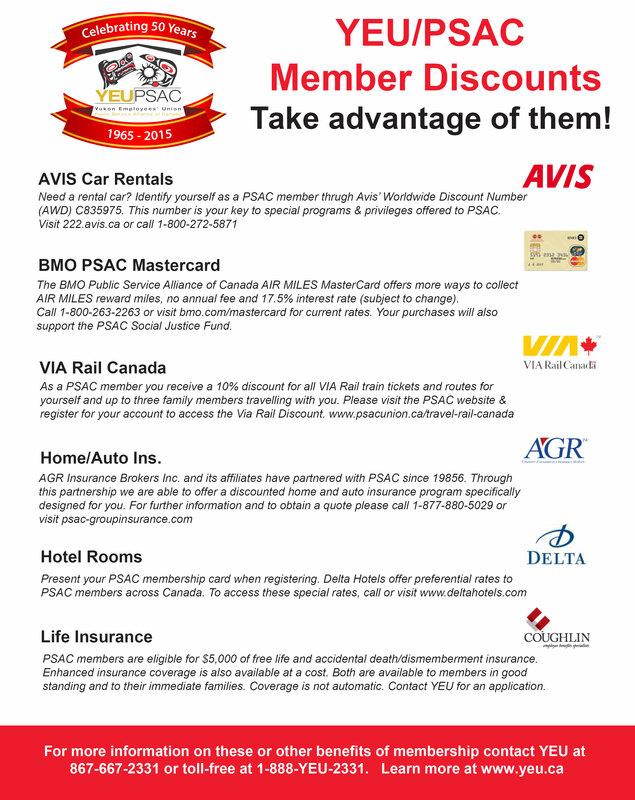 YEU members & PSAC National members who want to become more involved are welcome. We included links to some items for your Union Bulletin Boards in the most recent Steward update email, and those links were lost in the shuffle as well. Call your Union…it’s really OKAY! 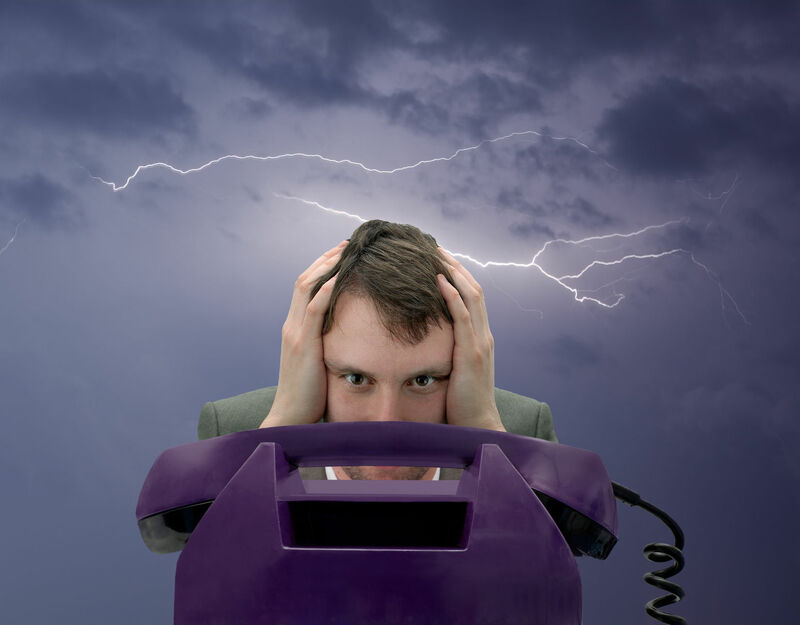 We often hear fear in peoples’ voices when they phone the union hall for the first time. There’s a hushed voice at the other end of the line, reluctant to make the call, afraid of negative repercussions. We ask for a name and there’s a pause… a beat while the caller considers whether it’s safe to give their real name. We are accustomed to getting just a first name. When we ask for details about the problem, we have to be patient. Sometimes the story comes out in tiny, vague pieces. Afraid of giving too much away, details are disguised and identities are masked. While we may get to the real story and names eventually, it requires careful listening and a lot of reassurance. There is fear that by calling your union you have set in motion something you can’t control. You are allowed to talk to your union! We will never, not ever, contact your employer without your express permission. If you have a meeting with a Shop Steward, they are bound by the same rules of confidentiality that we are here at the Union Hall. They are trained, knowledgeable and discreet. Sometimes the problem you are experiencing at work is not grievable; that’s a fact. Your union rep will help determine whether or not there are grounds for a grievance. If there are, the decision to proceed is yours. If, after discussion with your union rep you choose to file a grievance, the process will be explained to you fully before any action is taken. You need to be comfortable with the way things progress. No grievance will be filed on your behalf without your consent & participation. If you choose NOT to file a grievance or proceed with any action, that’s okay too. Sometimes all you need is someone objective to help you see things more clearly. If you are called to a discipline meeting with your employer, you have a right to union representation. Call us as soon as you are told of a meeting and we will make sure you don’t go into it alone. Your Collective Agreement is a big document. It may seem daunting but it’s worth a read. Your workplace probably has a Shop Steward or union representative who can take some time to go through things with you if you’re not sure. If you don’t know who to call, then please call us. We’re here to help. You can call us at (867) 667-2331. If you live in the communities, call us toll-free at 1-888-YEU-2331 (1-888-938-2331). And hey; you can always email contact@yeu.ca.